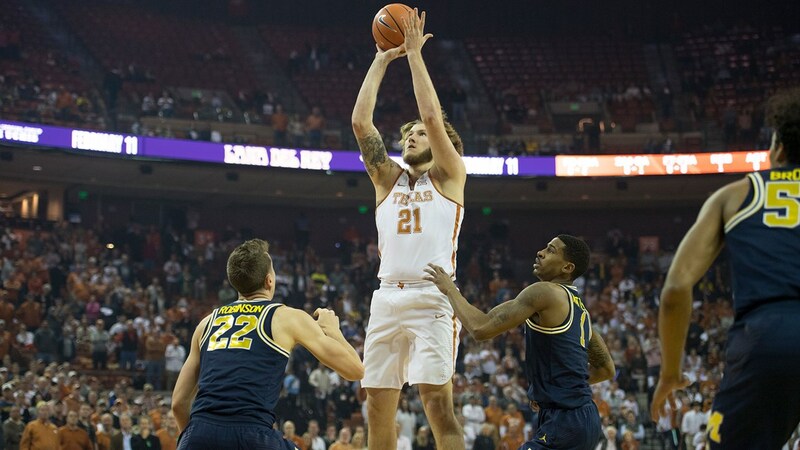 Forward Dylan Osetkowski scored 15 points, pulled down seven rebounds and had a career-high seven steals in the Longhorns' 98-88 loss to Georgia in the SEC/Big 12 Challenge (photo courtesy of texassports.com). ATHENS, Ga. — Freshman guard Courtney Ramey scored 19 points to lead five Longhorns scoring in double figures, but the Texas men’s basketball team still came up short against Georgia, 98-88, at Stegeman Coliseum as part of the SEC/Big 12 Challenge presented by Continental. With the loss, Texas fell to 11-9 overall (and still 3-4 in the Big 12), while Georgia crept above.500, at 10-9 (and 1-5 against SEC opponents). The Bulldogs hit 32 of their 48 (66.7 percent) of their shots, including 12 of 17 (70.6 percent) from behind the three-point line. The other Longhorns who scored in double figures were guard Kerwin Roach (16 points), forward Dylan Osetkowski (15), forward Jaxson Hayes (14) and guard Jase Febres (11). Georgia guard Tyree Crump led all scorers with 21 points, while Nicolas Claxton and and Teshaun Hightower added 18 points apiece. Texas recorded a season-high 17 steals, and forced a season-high 24 Georgia turnovers. Ramey connected on seven of 15 shots from the floor, including a career-high five three-pointers, and added five assists. Osetkowski turned in a well-rounded performance, pulling down seven rebounds and snagging a career-best seven steals to go along with his 15 points. The Longhorns now have split six appearances in the SEC/Big 12 Challenge, and lost for the eighth time in 13 games all time against Georgia. The Longhorns head home to host No. 9/10 Kansas at 6 p.m. Tuesday at the Frank Erwin Center in a game that will be broadcast nationally on ESPN.